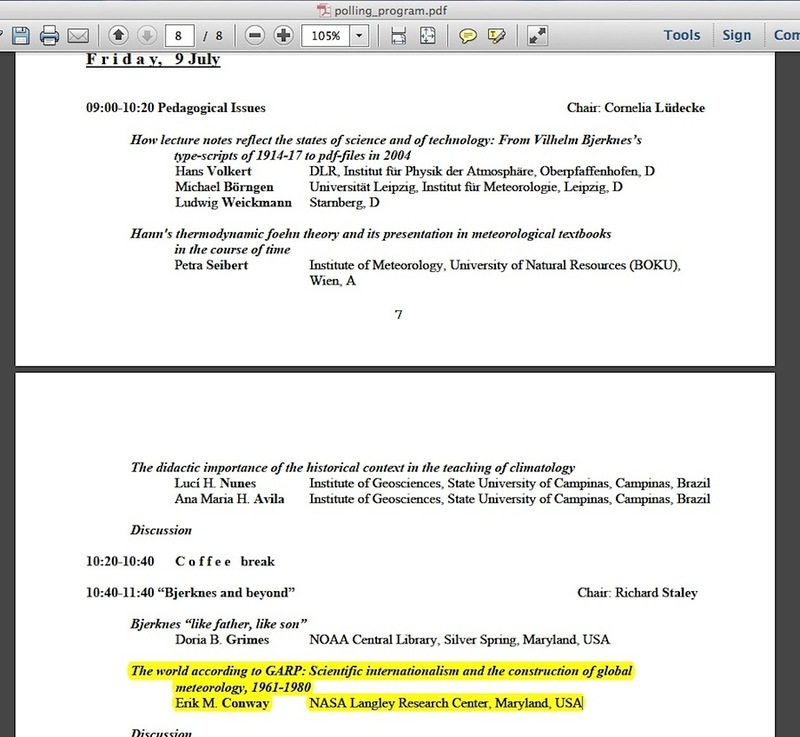 In telling the tale of inadvertently discovering how skeptic climate scientists are corrupted, a person might be viewed as a hero or heroine, and it is understandably forgivable if the hero/heroine has a memory lapse about exactly when this event happened, or about minor narrative details surrounding it. But when the tale takes on an increasing appearance of being a fabrication designed to make the person look like a hero/heroine, unbiased objective thinkers will start to wonder why there would be any necessity for that kind of embellishment, and they might also wonder if there is something inherently wrong with the core of the tale. 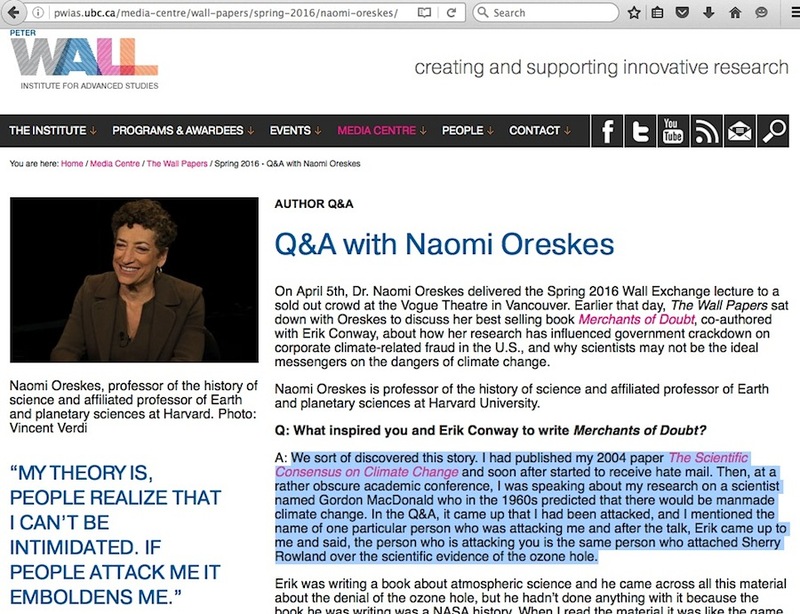 I’ve already detailed in my July 26, 2016 blog post how Naomi Oreskes’ own written words fatally undermined the timeline of her repeated stories on how her then-future Merchants of Doubt co-author alerted her to critics of her 2004 Science paper. Now, contradictory spoken words from Oreskes and her co-author make that dicey tale incrementally worse. she was verbally attacked for the content of her paper. Later, at an obscure academic conference, she was approached by Erik Conway during the Q & A time after her presentation about geophysicist Gordon J. F. MacDonald, and he alerted her to who one of her attackers was. 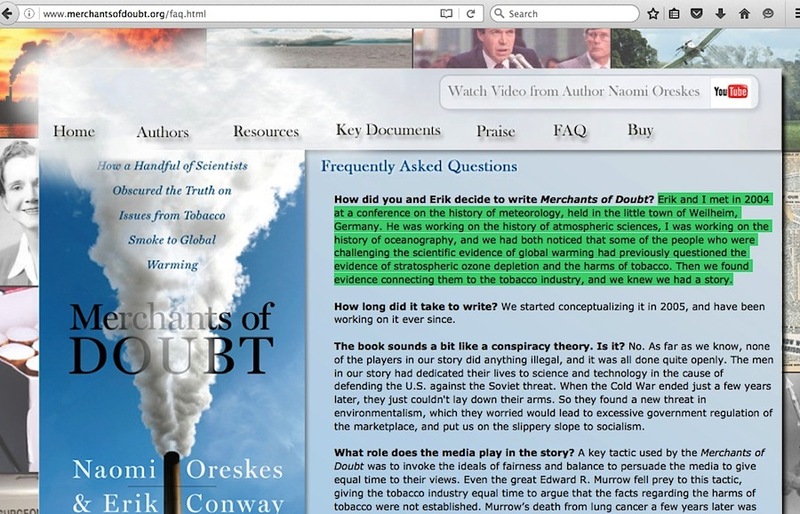 the attacker that Conway spoke of was a person who not only questioned the evidence of global warming, but also the evidence of ozone layer depletion; this obscure academic conference took place in Weilheim, Germany. 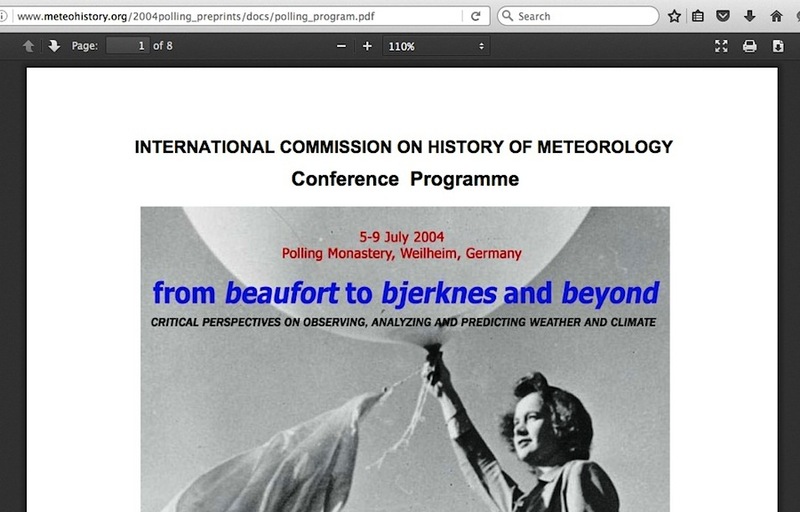 the conference where Conway and Oreskes were presenters took place in July 2004, which Oreskes’ own resume confirms. Conway was thus alerting Oreskes to the of attackers of her Science paper who would not be mounting their attack until at least five months into the future. 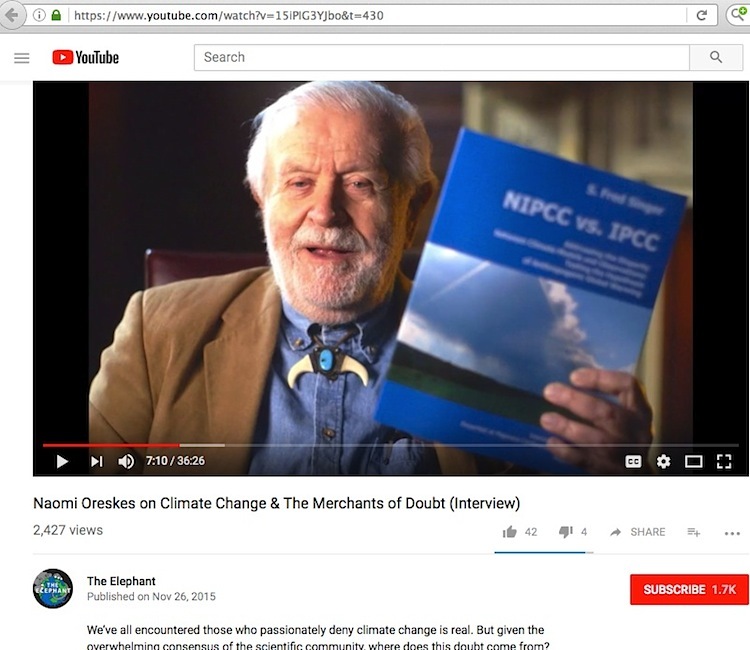 5:24 point of this video: There was no debate about the reality of climate change. So I wrote a paper in 2004 that said that, and immediately I became the target of attacks. And it was those attacks, it was me actually becoming a victim of the merchants of doubt, which led me to try to figure out who are these people, why are they attacking me, why are they claiming there is no consensus … and it was that set of questions based on my own being attacked by these people, that led to the book and now the film Merchants of Doubt. 6:03 point, after the interviewer asks her what the nature of those initial attacks were: That I was a stalinist, that I was a communist, that I was attempting to suppress scientific debate, that I was part of a liberal conspiracy to bring down global capitalism …. Yes, she did. Three times. Made doubly ironic by the unchanging photo of him for this Youtube audio interview. She just didn’t say outright that Dr Singer had worked for ‘Big Tobacco,’ but some people, particularly Al Gore’s followers, would do a connect-the-dots thing between him, the George C. Marshall Institute and Frederick “Reynolds Tobacco” Seitz. See what happened to Oreskes’ timeline from this interview, compared to what I detailed in my July 26, 2016 blog post? 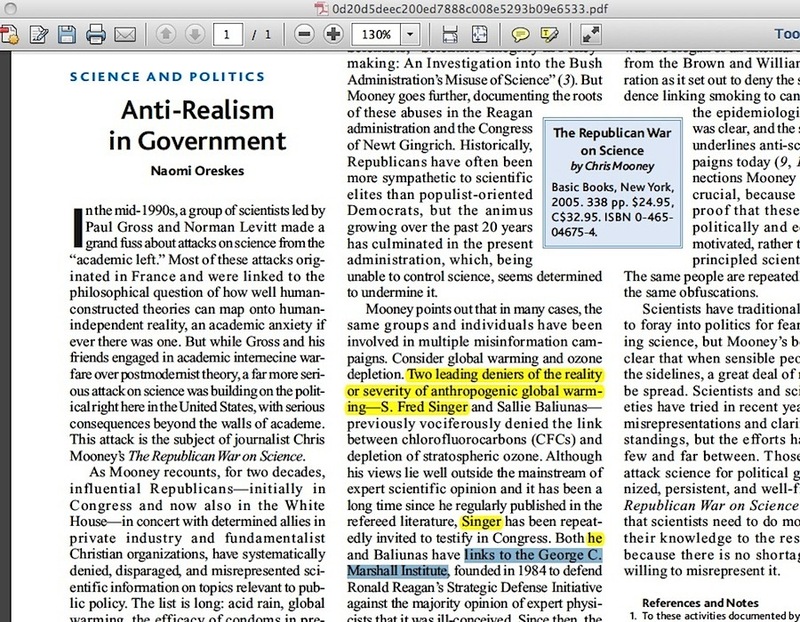 It went from the impossibility of Erik Conway alerting her to critics of her December 2004 Science paper five months in advance, to Erik alerting her to who her main critic was to her October 2005 Science review of Chris Mooney’s book fifteen months in advance of the situation. In advance of the time where Oreskes and Conway first met at that July 2004 German conference, that is. Not only is the date corroborated for the conference literature itself regarding Conway’s attendance there, other people’s writings corroborate it. 1:25 point: Naomi and I met at a meeting in Germany, a history of meteorology meeting in 2004, during the summer. 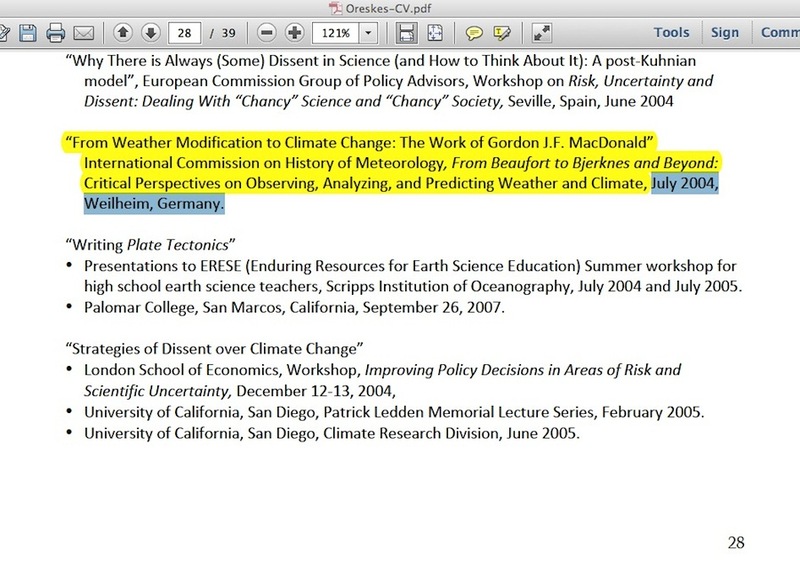 She was working on J Gordon MacDonald … and I was doing history of meteorology work…. 3:08 point: … and then we knew we had a story to tell. 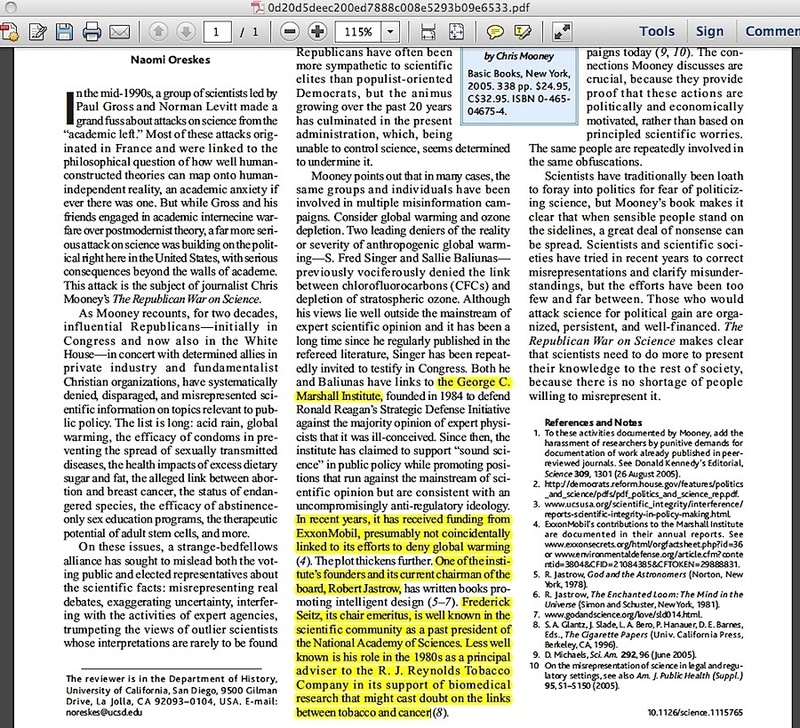 The irrefutable fact of this situation is that there is no way for Oreskes to move the dates of when her Science paper was published, or when her review of Chris Mooney’s book was published, or when Dr Singer started criticizing her work. And, her narrative does not align with Erik Conway’s. But is Conway’s version of this timeline without fault? His bit about “probably 2006” regarding Oreskes’ ‘tobacco / fossil fuel industry’ connect-the-dots exercise is sketchy, but he apparently undermines that collective situation in a totally different manner, and that potentially huge problem will have to wait for a Part 2 blog post. If Conway and Oreskes were placed under oath in courtroom appearances or in congressional hearing appearances, would their narratives be forced to line up right? That’s a good question. At a rock-bottom level, this question must be asked: if a particular set of details is as damaging to Dr S Fred Singer as it is portrayed to be, why would there be any need whatsoever to embellish the situation surrounding it? This entry was posted in Embellishments, Timeline inconsistencies and tagged Chris Mooney, Erik Conway, Naomi Oreskes, S. Fred Singer by Russell Cook. Bookmark the permalink.